The wolf gives an intense stare back toward the camera for only a moment before scurrying into the safety and seclusion of the aspen- and pine-filled forest. Wolves in South Dakota, in this day and age? Impossible right? 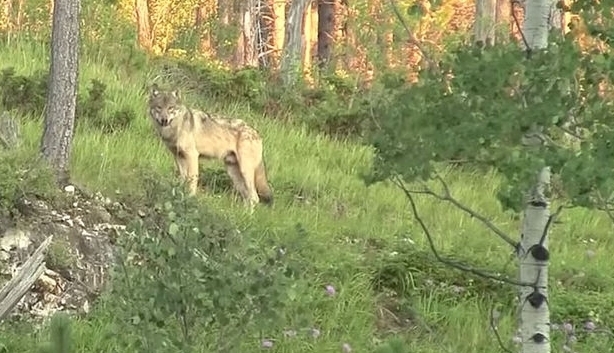 Well, apparently not - a video clearly shows a gray wolf allegedly roaming the Black Hills. "More than likely it is a lone male just traveling through the area though," said John Kanta, regional wildlife manager for the South Dakota Game, Fish & Parks, explaining that young males sometimes range into the Black Hills from Wyoming or the Great Lakes population in Minnesota. The Black Hills have been considered sacred for millennia to many Native American nations from the United States and Canada. This unique geographic area contains the oldest mountains in the world. For thousands of years, hot mineral springs were used by indigenous people for healing purposes. Grizzly bears, black bears, wolves, and buffalo roamed and lived in these sacred mountains. However, they all disappeared with the illegal trespassing into this area by Euro-Americans in the late 1800s. Black Hills creeks are known for their trout, while the forests and grasslands offer good habitat for white-tailed and mule deer, pronghorn, bighorn sheep, mountain lions, and a variety of smaller animals, like prairie dogs, American martens, American red squirrels, Northern flying squirrels, yellow-bellied marmots, and fox squirrels. Responses to "The Mighty Gray Wolf spotted in the Sacred Black Hills for first time since 1800"
there was one seen last week over in the Vale area, have been told they are around Bear Butte.